CAMPERS from Hess Kramer at a seaside outing before the fire. 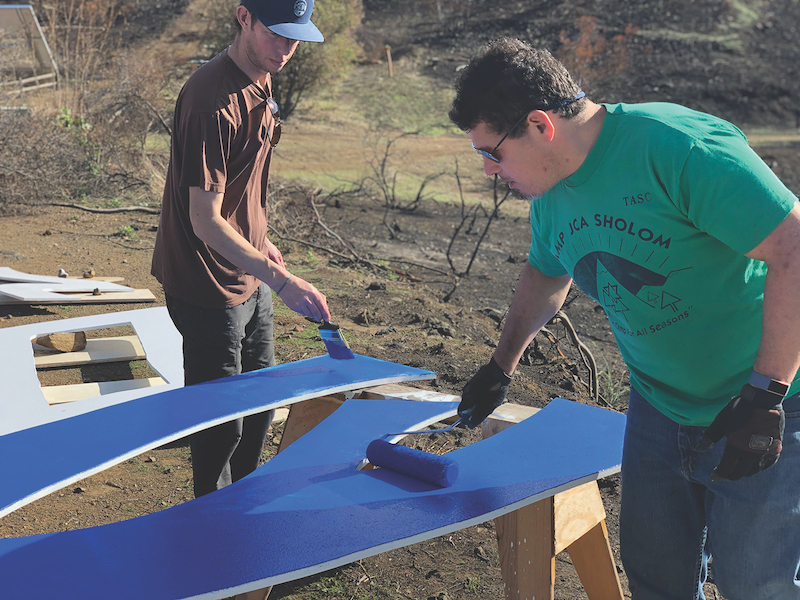 When the Woolsey Fire swept through Malibu in the second week of November, losses included three popular Jewish camps: Camp Hess Kramer, Gindling Hilltop Camp and Camp JCA Shalom. Reeling from the wildfire, yet determined to persevere, each camp has found a way to carry on its operations this summer. Camp Hess Kramer and Gindling Hilltop Camp are sister camps affiliated with the Wilshire Boulevard Temple. Camp Hess Kramer opened in 1952 as the first camping program for Jewish children west of the Mississippi. Increasing demands for enrollment led to the creation of Gindling Hilltop Camp in 1968, which was built adjacent to the original Malibu property of Camp Hess Kramer. In addition to hosting school-year retreats for the Los Angeles Unified School District and other organizations, Hess Kramer welcomed around 270 campers each summer while Hilltop welcomed approximately 120 campers. 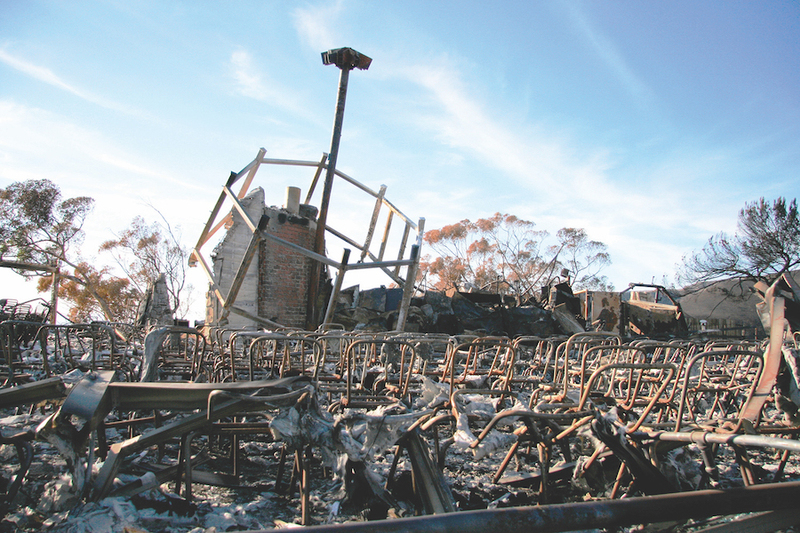 “Before the fires, this was a gorgeous, beautiful space. It was where lots of people spent their summers making friendships that they wouldn’t otherwise have connections to and building a Jewish community,” assistant director Erica Feinman said. The blaze consumed 90 percent of the grounds and 87 out of 97 structures. The camps have been relocated to Calif. State University Channel Islands for the summer, 15 minutes north of the camps’ Malibu properties. “It really wasn’t a question. We knew that deven in the hard times that there was going to be camp no matter what it took, and it wasn’t an option for us to not have camp,” Feinman said. Cal State Channel Islands offers the outdoor environment and modern facilities needed for the camps to maintain most of their traditions. They will still embark on weekly beach days, eat popular grilled cheeses and celebrate Shabbat on Friday nights, along with customary arts and crafts, ceremonies and celebrations. Staffers are working on installing a rock wall and high ropes course like those at their previous campgrounds. The most notable change will be campus dormitories replacing the wooden cabins. Camp administrators intend to hold to the five-to-one camper-to-counselor rooming ratio, but campers will also enjoy an early exposure to the typical college experience. CAMP BUILDING at Hess Kramer after the fire. Reconstruction in Malibu has not yet started. Given the record-breaking rainy season in Southern California, opportunities to rebuild have been scarce. Mudslides and rain prevented substantial progress. Administrators have postponed plans until after the rains are safely behind. “It’s not just like rebuilding a home. It’s like rebuilding a neighborhood with over 60 buildings to be rebuilt plus infrastructure of roads and electricity and plumbing and all that,” Feinman said. The loss of the facilities has tightened their community, bringing people together, from alumni to current campers to members of the Jewish community. “Camp isn’t just about the place. It’s about the people. And we’ve been able to see that through the pictures that people have shared on our social media pages and the impromptu Shabbat gatherings that people have put on with their friends and alumni from across the world,” Feinman said. Camp JCA Shalom is a 20-minute drive inland from Hess Kramer and Hilltop. It is located on Shalom Institute’s 225-acre campus and similarly acts as a summer camp and year-round retreat. 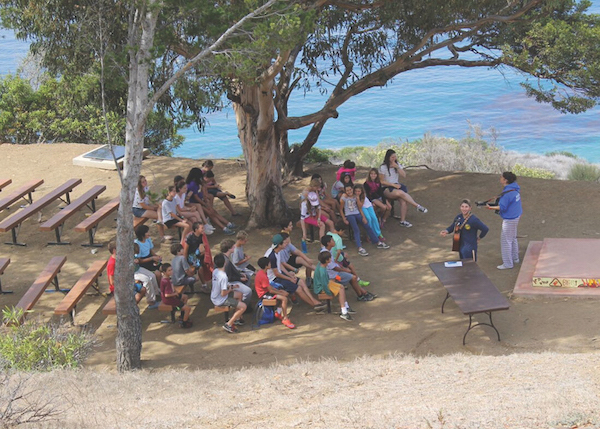 Approximately 25,000 people visit the Malibu campus during the year, but only 900 of these visitors are summer campers. The site also plays host to over 15 family camps each year, programs for local religious schools, community programs and Shemesh Enterprises, a farming program for young adults with special needs. “It’s one of the most vibrant and supportive and encouraging communities I’ve ever been a part of…” Program Director Riona Feves said. The camp was evacuated on Nov. 9. Staff and emergency workers saved the animals, equipment and Torah scrolls. The fire consumed everything other than a few adult housing structures, trees and the swimming pool. “I know two people who got married at camp and have been bringing their kid to camp since he was an infant. People have gone through major life changes at camp and associate memories with the place,” Feves said. All of the programs are running with the help of the greater Jewish community. Camp JCA Shalom will be held, however, at Gold Creek Center in the Angeles National Forest. Gold Creek Center belongs to Hallelujah Prayer Center, an affiliate of the Korean Presbyterian Church. “They don’t typically rent out during that time period, but they found out about us, and they decided that this would be the time,” Camp JCA Shalom director Joel Charnick said. CREW creates the Shalom sign. Meanwhile, staffers have started the slow process of rebuilding, raising funds and obtaining permits to begin work on the campground. The Jewish Federation and Foundation for Jewish Camps have been especially instrumental and supportive. “These two organizations have gone above and beyond, and that’s kind of what has helped prop us up in our time of need,” Charnick said. Members of the JCA Shalom Teenage Service Camp (TASC) have plans to start on building smaller structures that do not require permits. “I think being together again in camp with the camp community and just being in the middle of all that magic is going to be very healing, and I think it’s going to provide a bit of closure for everyone,” Feves said. Charnick and others have rebuilt one crucial structure for the camp already: their shalom sign, the first image of the camp as campers arrived. Charnick contacted the original builders and, in December, they traveled to the charred site and rebuilt it throughout the night. “The message was that we’re going to rebuild this thing. It’s going to take a while, and the time in between is going to be difficult. Sometimes it’s painful, but then we’ll be back. And when we’re back, we will be better than ever,” Charnick said. Talia Abrahamson is a junior at Marlborough School.